Another type of Rhynia gametophyte ? The gametophyte* of Rhynia gwynne-vaughanii was first pictured in 2000 without being recognized as such , then thoroughly described by H. Kerp et al. as Remyophyton delicatum and presented at the Rhynie Chert Conference in 2003 . Also in 2003, a small (0.4kg) piece of chert found well away from the site of the type specimen revealed a few bulbil-like objects laterally attached to an axis (Fig.1). Although their lateral position does not fit to any of the known gametophytes, their aspect, and their attachment to the shoot by a short pedicel in particular, suggest a tentative interpretation as antheridia. A granular structure which might be the remains of sperm cells in rows is seen in the bulbil on the right in Fig. 2. 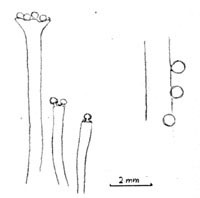 Fig.1: Bulbils (antheridia ?) laterally attached to an axis by a short pedicel; section of Rhynia sporangium with black abscission tissue nearby. Fig.2 (right): Detail of Fig.1, granular structure in the bulbil on the right. 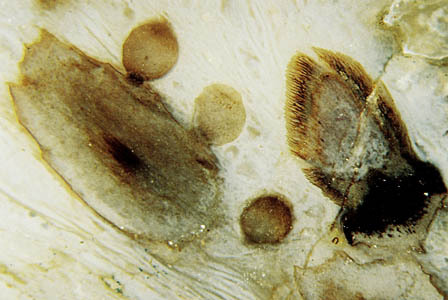 The chert sample also contains axes which would doubtless be assigned to Rhynia because of their typical wart-like bulges and their diameter of 1 to 2 millimeters. Also there are sporangia of the Rhynia type. Incidentally, a tilted section of such is seen in Fig.1. The black tissue is thought to be the pre-formed rupture site allowing the sporangium to break off, as proposed in . So we are confronted with the fact that a chert sample with Rhynia contains something suggesting an interpretation as a gametophyte clearly differing from Remyophyton (see table below and Fig.3) as well as from any other known gametophyte of the Rhynie chert plants. The position of the antheridia on the flat or slightly bowl-shaped top of the axis is part of the definition of Remyophyton in . 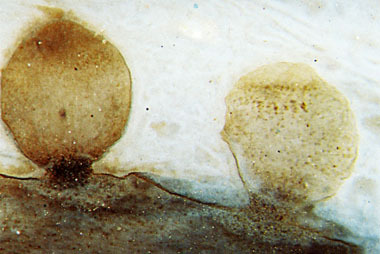 Fig.3: Antheridia on the top of Remyophyton delicatum (left), after ; bulbils (antheridia or what else ?) arranged on an axis as seen on the cut face of this sample (right). (1) The definition of Remyophyton delicatum in , apparently based on only one chert sample, may not be adequate to the variability of the species. (2) What is seen in this sample might be a gametophyte belonging to a hitherto unknown sporophyte species, possibly another Rhynia species, judging from axes and sporangia in the same sample. (3) The bulbils attached to the axis may belong to some fungus incidentally mimicking antheridia of early land plants. Investigation of the chert sample with advanced equipment may provide more information. * Note that the Rhynie chert plants, like extant ferns, bring forth alternating spore-bearing and gamete-producing generations. While the gametophyte of ferns is tiny, that of the early land plants may be not so much smaller than the sporophyte. Geol. Soc. London Special Publication 180(2000), 439-57. Trans. Roy. Soc. Edinburgh, Earth Sciences 94(2004 for 2003), 411-28.
gwynne-vaughanii, Rev. Palaeobot. Palynol. 29(1980), 177-88.